This is one of my favorite races! It comes right at the perfect time and it’s a great way to kick off the year with a fun race! It’s also local and is held close by at Salem Lake. Last year, Cara and I had an amazing time and I actually PR’ed unbeknownst to me. I actually didn’t even realize it until I looked back at all my 2014 races. I love when that happens! This year, I’m ran the race as a training run and by heart rate. I have to stay on the right path leading me to Gasparilla and Tobacco Road Full. I got to the start early. Parking can be tricky at Salem Lake and I wanted to try to park as close to the start as I could. I had already gone the day before to get my bib and tech tee, but I had to exchange my tee for a different size, which they did! The weather was really dreary. It luckily had stopped raining but it was misting and foggy. The temperature was actually pretty ideal, right at mid 40’s. I had planned on wearing a tank, arm sleeves and skirt, but ended up throwing on the race shirt over my tank. I was glad I did. I ended up wearing it for half of the race. I started out at a good pace thinking that she’ll catch me by the time we get to the first hill. I caught up with Eddie who was running the 50K and we ran and chatted for the first mile. Keith had caught to me right before the hill and said Christine was right behind me. I hit the first big hill and said bye to Eddie, knowing I didn’t want to hold him up and there was no way I could make it up this hill with my HR. I was right. I walked the hill knowing that Christine would surely be there in just a minute. Well she wasn’t. I walked back just a bit to see if I saw her. Carole was right there when I turned around and asked her if she saw Christine. She hadn’t either. I walked back up the hill and figured that she must be in front of me. I told Carole if she saw her to let her know I was going to stop at the 3 1/2 mile water stop just in case. I carried on solo. I was actually enjoying the run and ran really well. I just found a good pace and kept at it. Around mile 4, I caught up to a guy named Josh who was running the 50K. We were running the exact same pace so we just kind of started talking and running. It was really great to just have someone to run with and the miles flew by. We got to mile 6.75-7 and I look ahead and see a girl who I think is Christine. I yelled her name and she turned around! I found her!! She was trying to catch me because she thought I was in front of her. We still can’t figure out what happened!! I was thrilled to see her. The three of us hung together for just a little bit more before Josh got ahead of us. We cheered him on and wished him well! We talked and chatted with several other runners too! We met a lady who was super sweet and so encouraging! We also met a guy who had ran the Graveyard 100 and ended up having to stop at mile 87. He was just coming back from some time off. Super cool guy! That’s the great thing about these type of ultra events…everyone is so nice and encouraging! We also commented that we were so glad we weren’t racing because we never would have met and chatted with these people! Again…numbers don’t make memories, people do! Christine and I just kept on trucking. We did the best we could on our heart rates and pulled back when we needed to and walked if we had to. We actually only walked just a handful of times and both commented that we had noticed that we were finally able to control our HR by just slowing down and not necessarily having to walk. Huge improvement! We made our way around the second loop, just running and chatting. We hit the turnaround and that was the first time all day that I looked at my watch to see what our time was. I had no clue! We had maybe .5-.75 left and we were at 2:45. We were totally going to finish under 3 hours! We were thrilled. That was our goal time given our HR training and how using how we did in Huntersville as a guide. I ended up finishing in 2:54:39. We came across the finish line, smiling and happy! So is MAF working? I had my first aha moment today! This is totally working! This is the first long distance run ever that I did not have to take a shot blok. I didn’t take in any nutrition. I didn’t need it. I had them in my pocket just in case, but I truly never felt bad. Proof that all this heart rate training is working! My body is learning to burn fat for fuel. Have you ran a race already this year? What’s your first planned event of 2015? 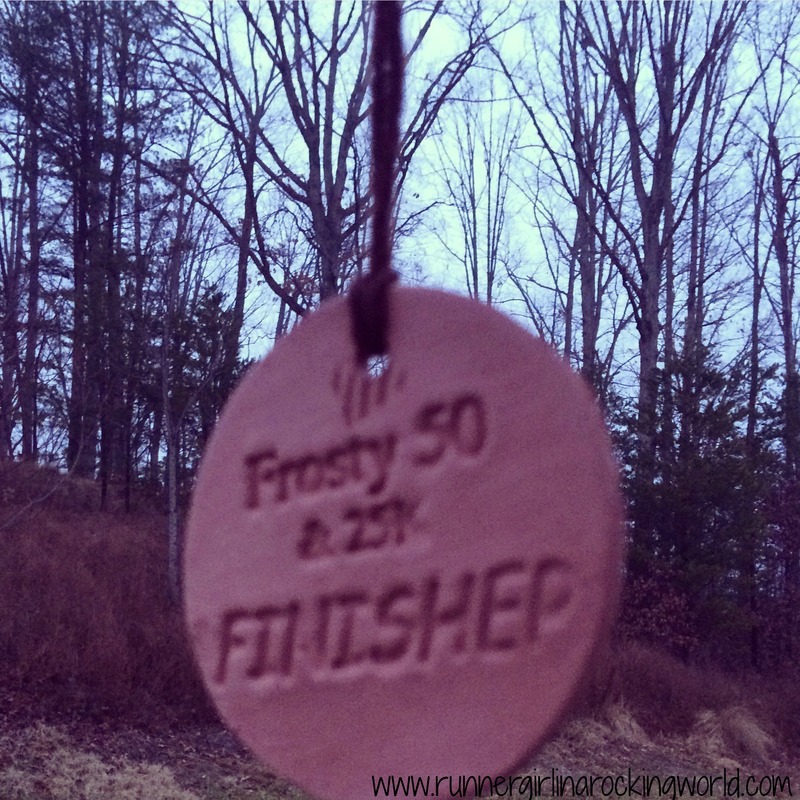 ← 2015: Fitness Goals and More!